I stumbled on the question of units inside the NodeBox application. What is internal logic of handling them? I was assuming that number for height for example is the abstract unit. The only question then is when I export the file to svg i get pixels and in pdf case - points. I was thinking to make some kind of recalculation inside the NodeBox file pt-mm, but maybe it is unnecessary. Thank you for the help! NodeBox is an entirely vector-based application so the pixels referenced in various node serve only as a relative size reference. Relative to what? 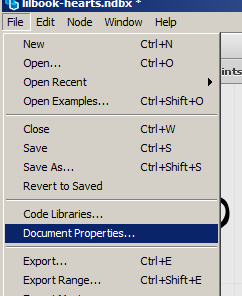 The canvas - as defined in Document Properties under the File menu. The canvas width and height determines the final output dimensions when you export a PNG or the size of each movie frame if you export a movie. PDFs and SVGs are also vector-based, so in those cases the canvas serves mostly to establish a default size and the overall proportion of width to height. If the PDFs or SVGs ever get printed (scaled to fit on a postage stamp or billboard) the extremal app you use will determine how many pixels ultimately get printed and how many inches or millimeters they get scaled to. So from inside NodeBox the pixels only serve only as a reference to measure how much wider one rectangle is than another, or whether a font seems big or small compared to other elements around it. If you know in advance that you are going to create a poster of a certain physical size at a certain resolution (e.g. 300 dpi), you can calculate the number of pixels involved and size your NodeBox canvas accordingly. In that case you could make a node to convert desired inches into pixels and use that to size your elements, but this would only apply to your own particular project.